Situated just a short walking distance (400 yards) from the beach and only a quick drive from an assortment of restaurants, retail shops, and recreational opportunities, Ocean’s Away is an excellent choice for your next Outer Banks vacation. This beautifully decorated 6-bedroom oceanside vacation rental home is located less than a quarter-mile from the nearest beach access, which is accessible via a paved path through the neighborhood and a wooden walkway that takes you over the sand dunes and onto the sunny stretch of shoreline that awaits you. When your day of fun in the sun on the seashore is coming to a close, head back to the house to hop in the bubbly hot tub or lounge by the large private swimming pool. If you’re feeling like participating in some friendly competition with your friends and family, venture downstairs to the ground-floor game room, where you’ll find a full-size pool table, stereo system, and flat-screen TV. Dog lovers who wouldn't dream of leaving their four-legged friends behind for a week will be pleased to discover that Ocean’s Away is a dog-friendly property that welcomes your pet to join you on your upcoming beach vacation. And because this beach house is located within the residential Whalehead Club community, you’ll find plenty of quiet side streets where you can safely go for a walk or jog with your furry family member. 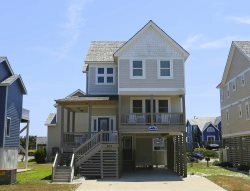 In addition to its close proximity to the wide, sandy beaches of the Outer Banks, this bright and airy vacation rental home is also conveniently located just minutes away from some the best attractions and amenities the village of Corolla has to offer. Drive a half mile to the south and you’ll encounter Monterey Plaza—a large shopping center that boasts everything from a grocery store, coffee shop, bagel joint and pizzeria to a donut shop, raw bar and grille, movie theater and more! A wide array of Outer Banks landmarks and attractions are also nearby, including the famous Currituck Beach Lighthouse and historic Whalehead Club—which are both just 3 miles to the north of Ocean’s Away—and the popular Corolla Adventure Park, which is only a 10-minute journey from your home away from home for the week. If you’re looking to combine a sense of adventure with a lesson in Outer Banks history, head to the four-wheel drive beaches—just five miles to the north—where you’ll have the once-in-a-lifetime opportunity to encounter the herd of wild horses that roam the beaches of Corolla. With its easy access to the Atlantic Ocean and an assortment of Outer Banks attractions, as well as its wealth of amenities situated right on-site, Ocean’s Away offers everything you need for your next vacation. Book your stay today!